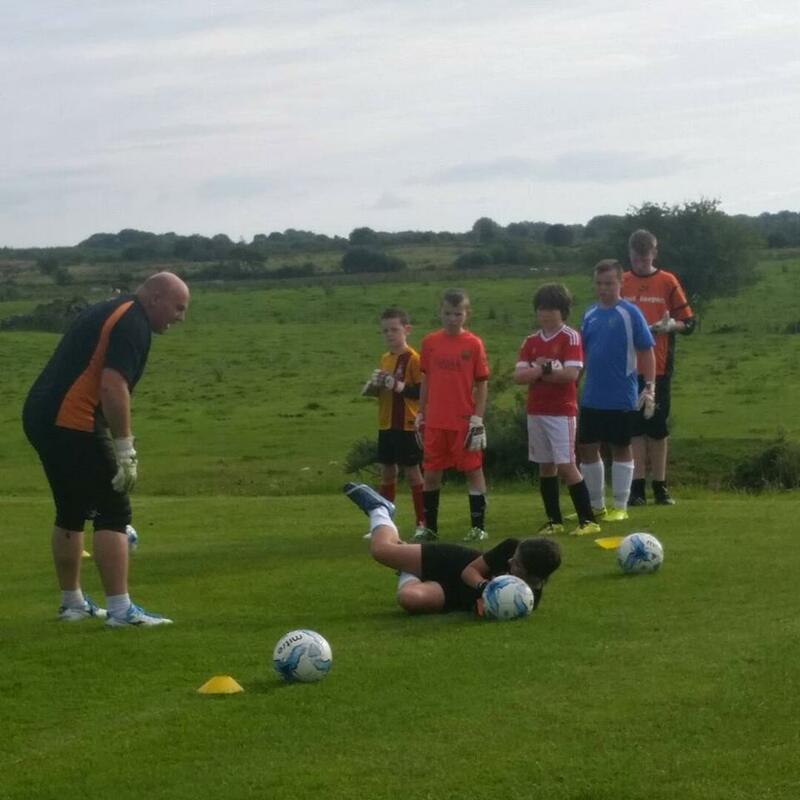 Over the last number of weeks the Kiltullagh Pioneers goalkeepers attend our Goalkeeping Development Programme. 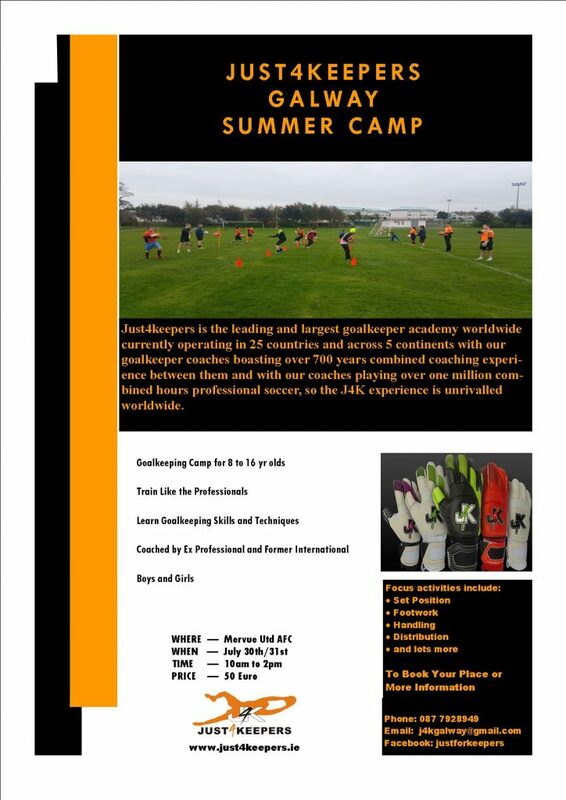 The aim of this programme is to cover the aspects of goalkeeping such as footwork, handling,positioning,distribution and much more. With this programme we guarantee the goalkeepers will improve and be better keepers. What do you do to prepare for the next game? After the weekend ,when you have played your game, what do you do to prepare for the next game? If you played a good game or didn’t play to your full potential the first thing to do is to evaluate your performance, but how you do this is important. Ever notice after a game no matter how you play you tend to focus more on what went wrong than on what went well, it’s human nature to be negative and hard on yourself when things don’t go the way you want. But did you know that when you focus on a negative all your doing is reinforcing that negative,when you do this there is more chance of repeating the mistake.That’s because what the mind sees the body does. Instead, after your game focus on three things you did well, and one thing you want to improve on, note I said “one thing you want to improve on” not one thing you done wrong. Change the negative into the a positive, this helps give you purpose, a goal to work to the following week after your game. this will make you feel like you are working towards improvement rather than feeling down about mistake. With so many goalkeepers coming to the end of assessments for league centers and trials for regional and national teams the fact of the matter is you all cant be selected. At Just4Keepers Galway/Mayo the hard work that the keepers are putting in is starting to bare fruit. 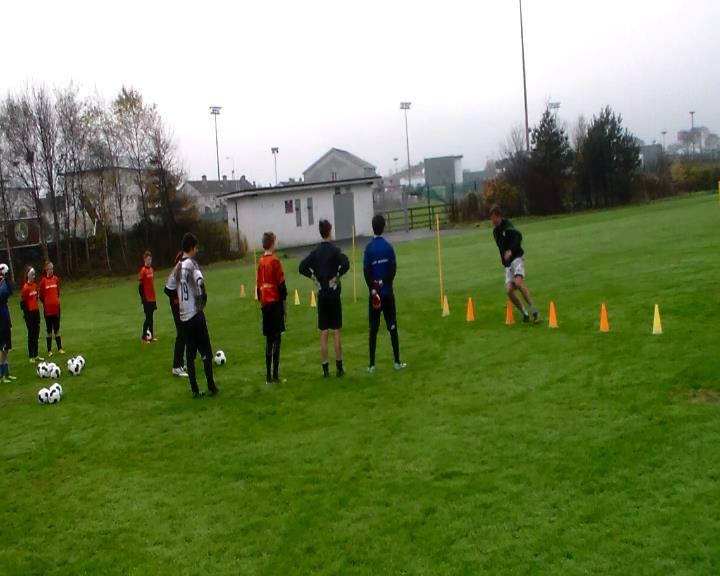 With so many of our keepers attending these assessments and trials from every age group from Under 11’s to League of Ireland Under 19’s to International teams (in one case 3 keepers for the same team ) it is important to remember your selection is based on SOMEONE’S OPINION and NOT A FACT that you are better or worse than another keeper. Should you get selected it is your your job to prove that opinion right, should you not get selected it is your job to prove that opinion wrong, either way the result is the same weather you get selected or not. You keep working on what got you to the level required to be invited into these assessments and trials. As your selection is based on someone’s opinion and not fact it’s possible to change their opinion. If your selected and become arrogant and lazy it’s easy for a coach to change their opinion, on the flip side if you are not selected and you put the work and effort in, again a coach’s opinion can change. Well done to all the keepers who were invited in and remember it was not luck that got you there, it was hard work, dedication and attitude and nobody can take that away from you . A striker can miss 10 chances to score and score a goal on the 11th chance and be called a hero, while a keeper can make 10 saves and make mistake in the last minute and be called a disaster. So what makes an average keeper a great keeper? A lot of it comes down to the ability to deal with the mistakes, what they do next after the mistake. The easiest thing to do is beat yourself up, hide away and keep replaying the mistake over and over in your head, (reinforcing a negative) but all that does is put focus on the mistake, the more you focus on the mistake the more chance you will make that mistake again. 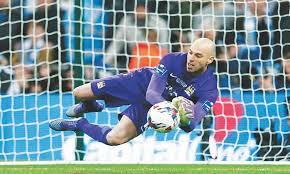 If your lucky enough to have a goalkeeping coach the next time your training talk to him/her, a good goalkeeping coach will help you through the situation, you can be certain that’s what Caballero did,but what if you don’t have a goalkeeping coach what can you do? Instead of focusing on what went wrong, refocus on doing what was right, replay the scenario in your head only this time your making the save, doing the right thing, imagine the cheers and jubilation after making that save, your team mates patting you on the back, singing your praises. Try to replicated the situation in your next session only this time your doing the right thing, (reinforcing a positive). 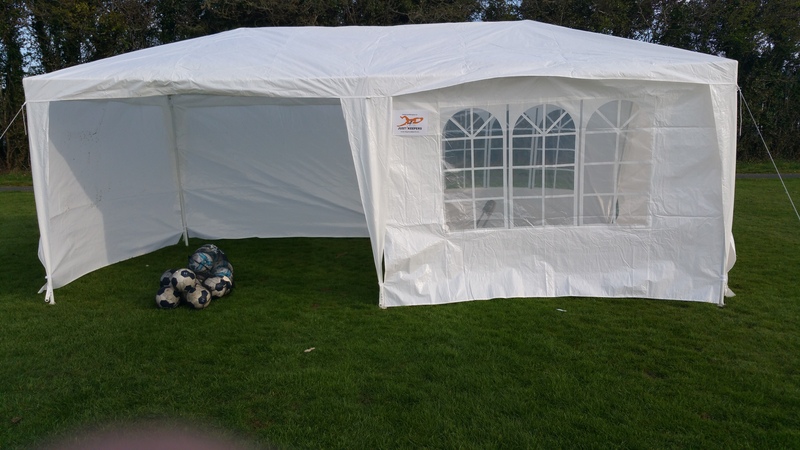 At J4K, the goalkeeping coaches are both current or ex-professional goalkeepers and goalkeeper coaches who have a vested interest in offering developmental and mental training to that professional standard. 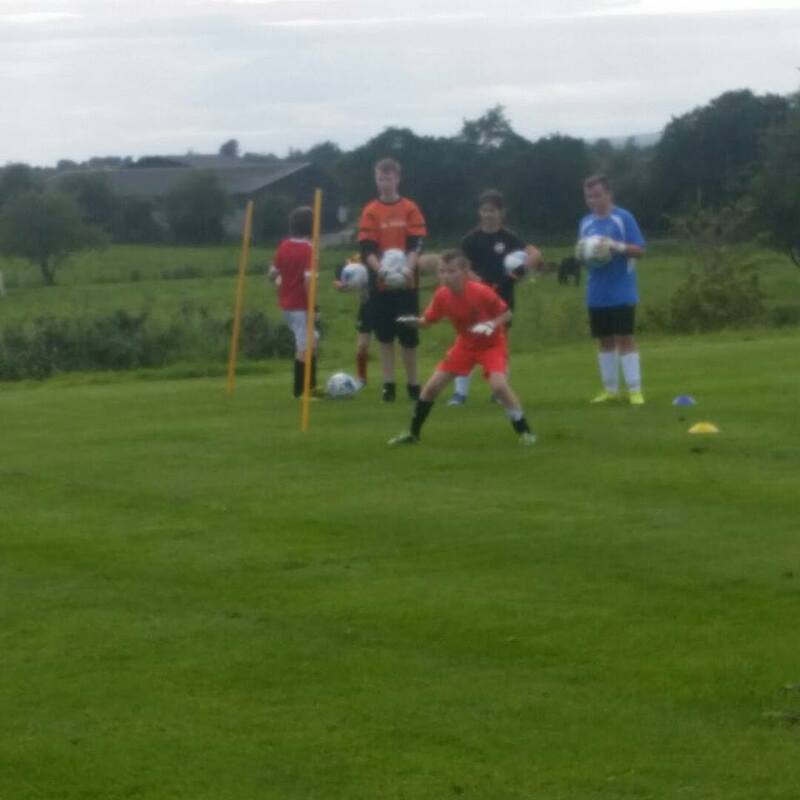 Regular goalkeeper training with J4K will enable a goalkeeper to understand the goalkeeper position to a greater extent while developing the skills and attributes necessary to compete in today’s game. 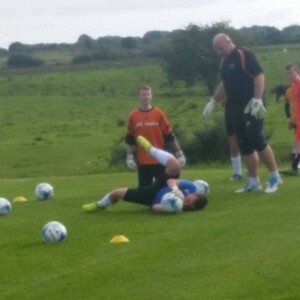 When coaching goalkeepers it’s important to coach all aspects of goalkeeping. As coaches at Just4keepers Galway/Mayo we try to develop all aspects of goalkeeping, technical, tactical, physical etc.,and part of this is coaching is reactions. 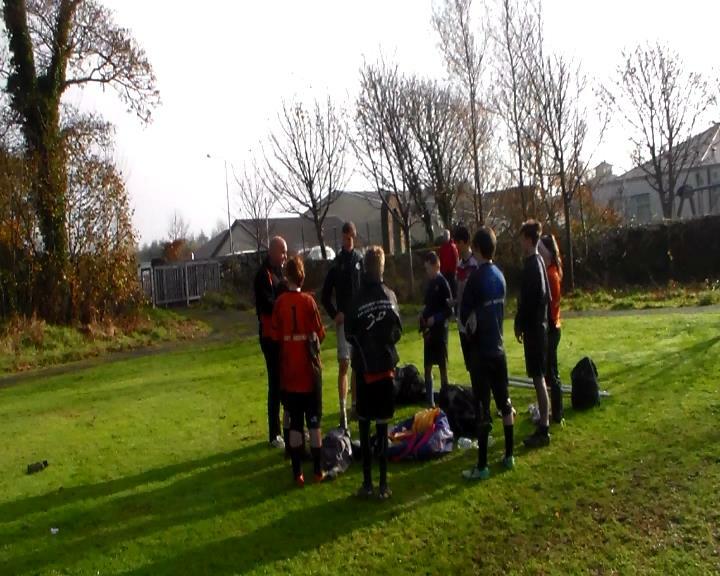 The start of most drills is usually with a verbal command like go, yes, start etc., these are audio response, you react to the call or the the shout, some drills are started by the goalkeepers movement, all have there place in a coaching session, however when we play matches our actions are determined by visual ques, we react to what we see, not hear. That’s why it’s important to help develop a goalkeepers reactions by using a visual que, like raising your hand or as in the video below a simple drop of the ball. Working on reactions while moving is as equally important as working on reactions that begin the movement. 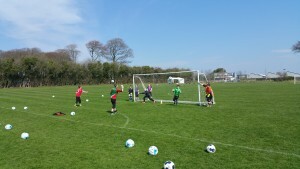 Just4Keeper’s 6 week Goalkeeping Academy in Mayo is well under way . 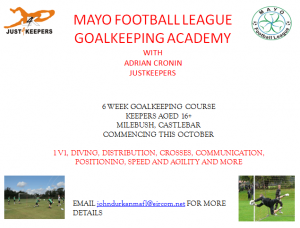 Through the Mayo Football League 16 goalkeepers have signed up and already improvements can be seen. Just4keepers Galway were delighted to be invited to Kiltimagh/Knock recently. 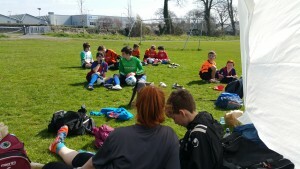 Great weather, great facilities and great keepers, well done all. 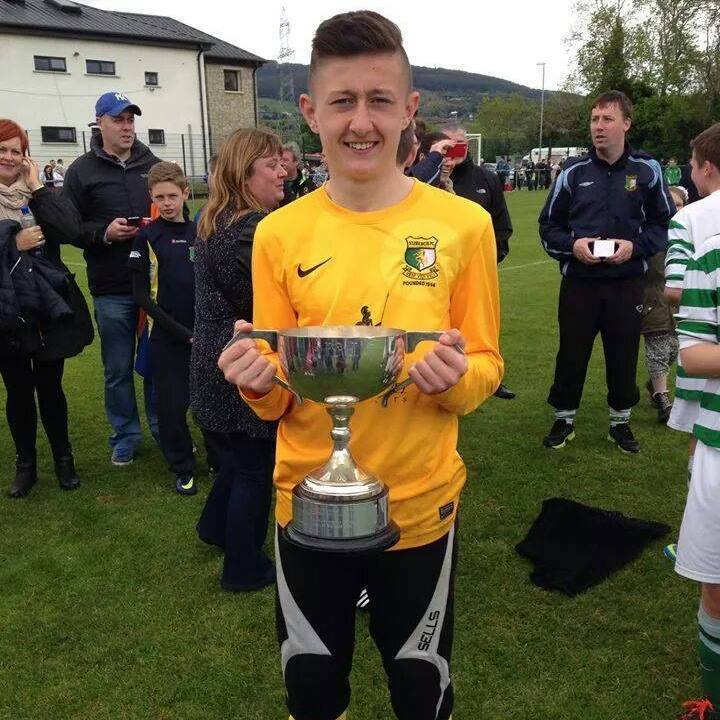 Congratulations to Just4Keepers Galway goalkeeper Sam O Gorman who has been selected for Irish trials after his perfomance with Galway in the Kennedy Cup. 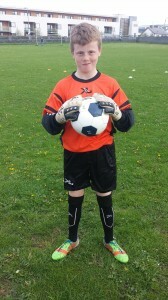 Sam has been working with J4K Galway coach Adrian Cronin for 2 years and is reaping the benefits of his hard work. Well done Sam. 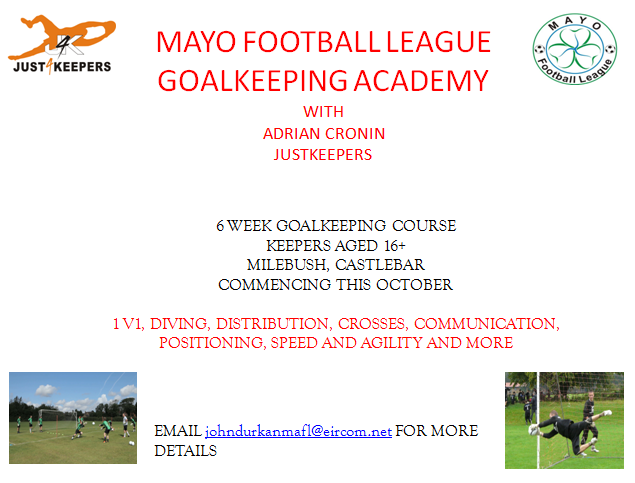 Just4Keepers are delight to announce our first one day camp in Mayo.The camp will be run by Just4Keepers Galway coach Adrian Cronin. 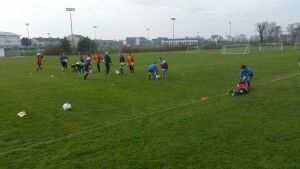 Just4Keepers Galway held it’s first goalkeeping camp this Easter and was a great success. Goalkeepers came from all over, developing and working on their techniques in a fun and learning enviroment. 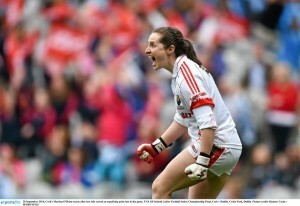 With the ever changing role of the goalkeeper in GAA it is no surprise that the demands and expectations have increased. The days of the big fella who doesn’t like to run and has a big kick out are nearing an end, more focus now is being put on the kicking technique ,flexibility, agility and speed along with the tactical and physiological aspects needed. Just4Keepers Galway goalkeeping coach Adrian Cronin’s successful work with goalkeepers in Galway has not gone unnoticed in the GAA circles. 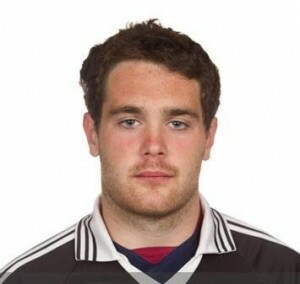 Adrian has been appointed the goalkeeping coach for the Galway senior and U.21 football teams, along with this there is great interest from hurling teams for Adrian’s services. Just4Keepers Galway welcomed Shamrock Rovers goalkeeper Conor O Malley who paid a visit to his old coach and Just4keepers Galway coach Adrian Cronin today. 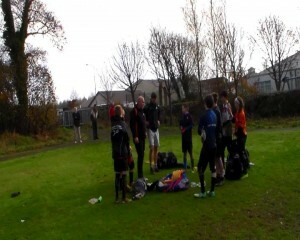 Conor participated is some drills and past on insights to playing at the highest level in Ireland as well advice . 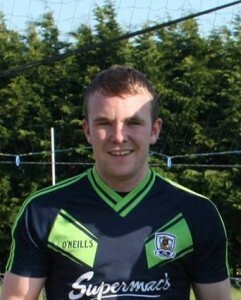 Conor joined Mervue Utd at the age of 17 from Westport Utd, playing with the LOI U19’s .While at Mervue Utd Conor made his International debut before moving to neighbours Salthill Devon for a few months, but then returned to Mervue to join the Mervue Utd League of Ireland team, where he played in the last 8 games, keeping 5 clean and helping them to the play offs. 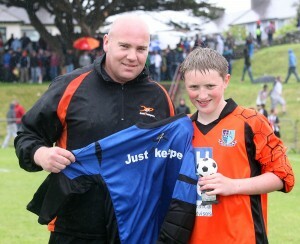 From this Conor earned a move to Shamrock Rovers where he earned player of the year for the B team in the first divison. 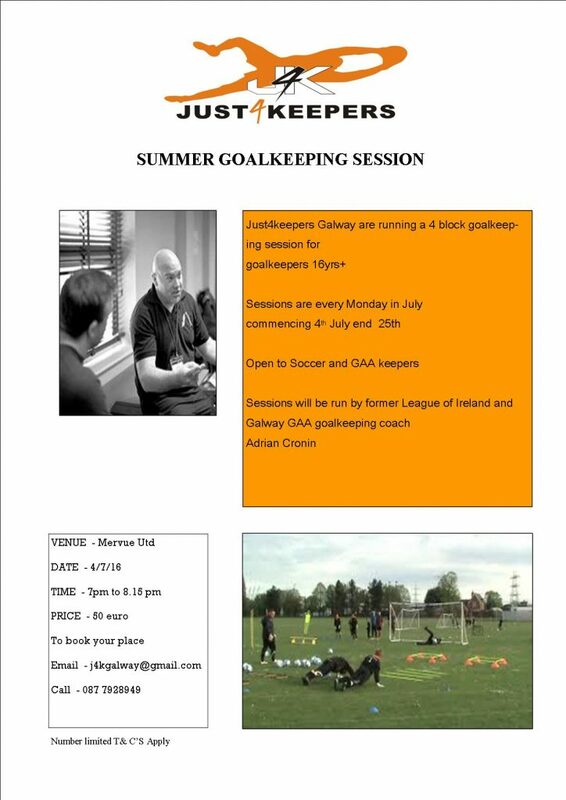 Conor spent nearly 3 years with Mervue utd and Adrian and was only too delighted to come down to Just4keepers Galway when invited to share his experiences with the goalkeepers in Galway. J4K Gloves ,The Winners Choice. “Hi I’d just like to thank you for the gloves that you so kindly gave to me for the all Ireland two weeks back. I had been desperately trying to find a pair that fit right for a month or so and hadn’t found any. Having been involved with the goalkeepers from the Galway Senior Ladies GAA team this year, what really impressed me, was not just their ability but their commitment. Only their family and friends saw the effort, time and expense put in to making training up to 4 times a week. 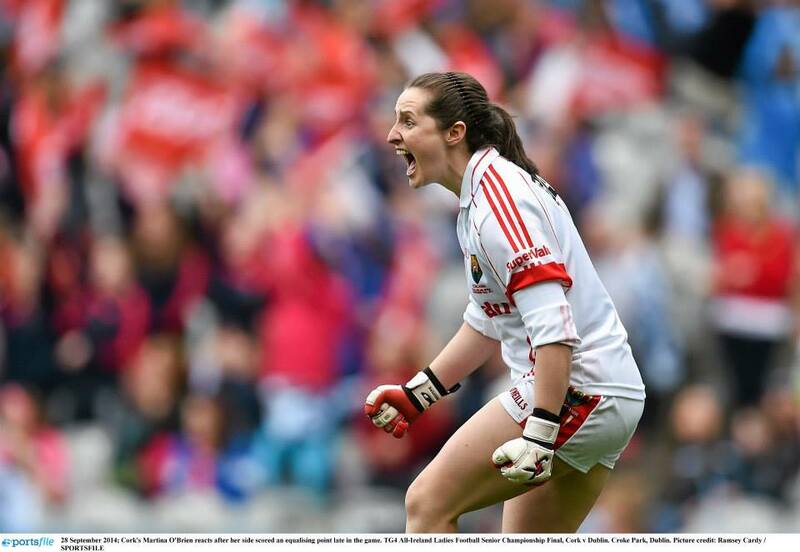 That’s why when Just4Keepers Galway got the opportunity to sponsor Cork Ladies goalkeeper Martina O’ Brien for the All Ireland Final there was no hesitation. Cian who plays for Mervue Utd and represented Galway in the Kennedy Cup has been working with Just4Keepers Galway Goalkeeping coach Adrian Cronin for a number of seasons through both Mervue Utd and recently the Galway FA Goalkeeping Development Program. 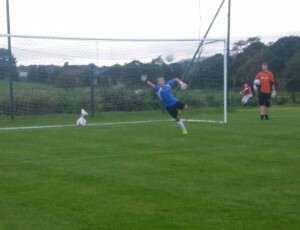 The goalkeeper is probably the most neglected player on the pitch in both soccer and GAA. 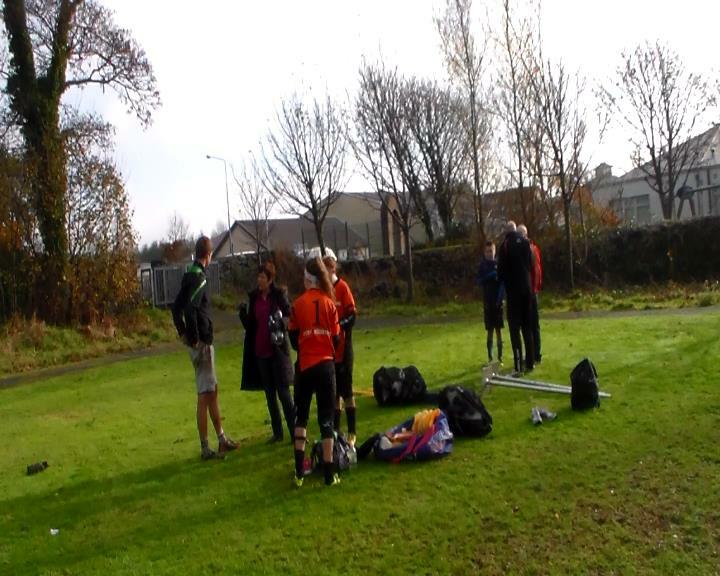 Just4Keeepers Galway is not just about Goalkeeping coaching in Galway, it’s also about recognising, promoting and supporting those who play there anyways. Congrats to Karen Connolly and her teammates, who won the U.14 Gaynor Cup today in Limerick. Karen played all 7 games only conceded 2 goals, put in a player of the match performance and saved a penalty in semi finals shootout. 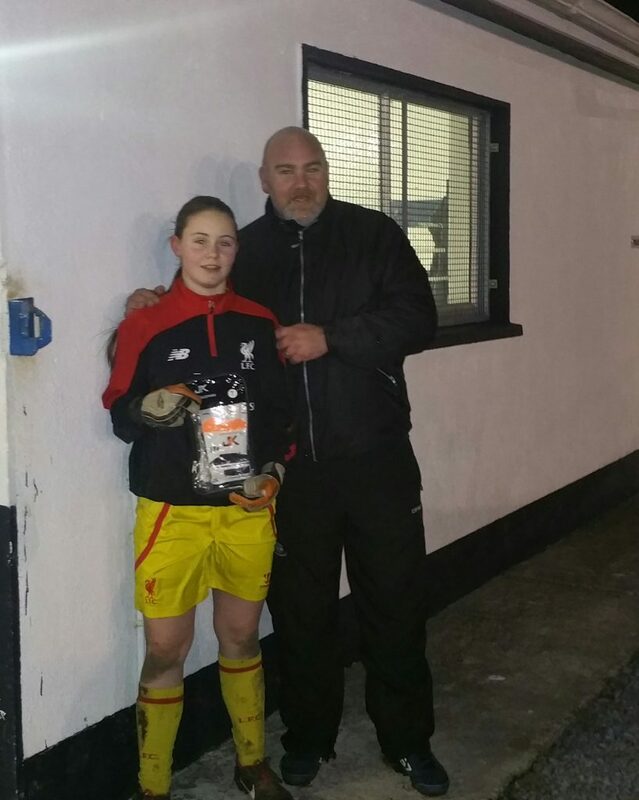 Karen is coached by Just4Keepers Galway goalkeeping coach Adrian Cronin through the Galway Development Programme. Karen has worked hard over the last 6 months on improving her game and the results speak for themselves as Karen has also won League, Connacht and School Cups in the last few weeks. A special mention has to go to Karen’s mum Helen for her support towards Karen’s development and Just4Keepers Galway. Also well done to Wexford’s Caoimhe Byrne + Sarah o Brian who won the Shield today at the Gaynor Cupattended J4K and also chose Just4keepers gloves. The All Ireland Goodson Cup Final U.14 was played today in Dublin Between Mervue Utd from Galway and St Francis from Dublin. 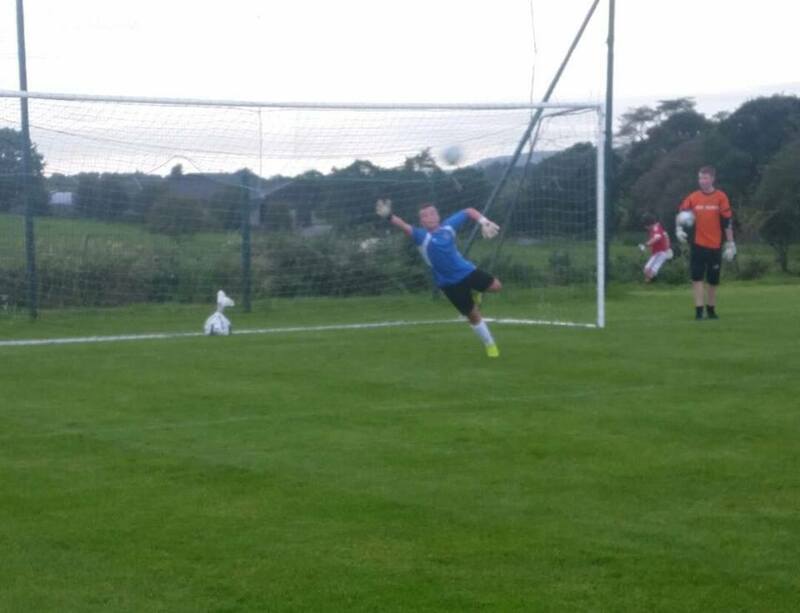 In the Mervue goal was Cian Mulryan, coached by J4K Galway coach Adrian Cronin and in the St Francis goal was Sean Prenter who attends J4K in Dublin with Matt Gregg. 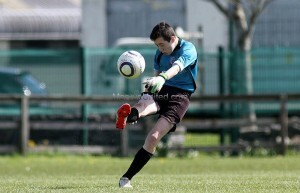 Both Keepers and teams played very well with Sean’s St Francis coming out on top 4-1. 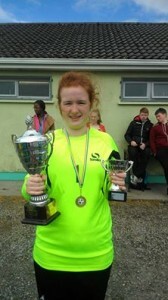 Congrats to Karen Connolly who won the schools soccer tournament in Tuam today. It was a brilliant final that had to be decided with penalties after extra time. Well done Karen on getting woman of the match. 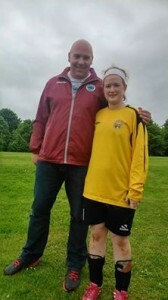 Karen is coached by Just4keepers Galway through the Galway FA Development Squads. 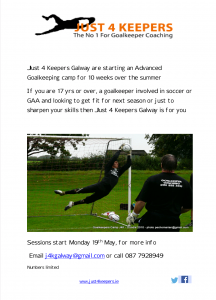 It’s just over a couple of weeks now since Just4Keepers Galway has started in Galway and week by week the academy is growing, providing goalkeeping coaching in Galway. 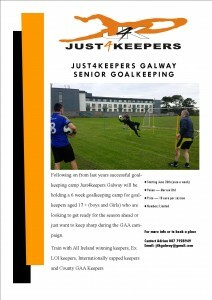 With keepers coming from all over Galway, J4K Galway is going from strength to strength. 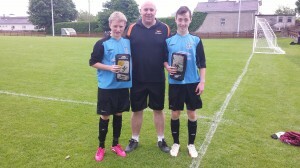 It also has been a good few weeks for keepers coached by Just4Keepers Galway goalkeeping coach Adrian Cronin. Adrian coaches keepers from different clubs all over Galway outside of the Academy and already most of these keepers have won leagues, cups, Connacht cups, and All Irelands with their clubs, Counties and schools , with more Connaught finals coming up and an Irish cup final. These keepers range in age from 10 to senior and their success is down to their commitment and desire to put in the effort. If you want to learn how drive you go to a driving instructor who shows you how to drive, you then go and practice over and over again to get better and get things right, If you don’t you get bad habits and while you may improve somewhat in time , you are not reaching your full potential, It’s the same with goalkeeping and that’s what Just4Keepers Galway is here for , to help you or your keeper reach their full potential, so if your looking for goalkeeping coaching in Galway why not try just4Keepers Galway. The Galway Kennedy cup squad was announced today and Just4Keepers Galway coach Adrian Cronin is delighted to be on board as goalkeeping coach. 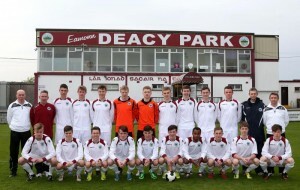 After months of trials and assessments Mark Greaney (Salthill Devon) and Cian Mulryan (Mervue Utd) have been selected. 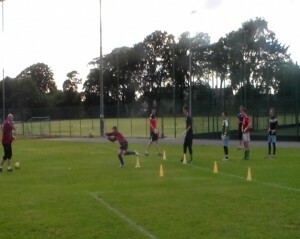 Great first session yesterday evening with keepers coming from all over Galway. J4K continues every Wednesday and your FIRST SESSION IS FREE. Remember goalkeeping is a specialised position and requires specialised coaching. If your son/daughter/goalkeeper is not getting specialised goalkeeping coaching how are they going to reach their full potential. Outfield players get a minimum of 3 hours a week to develop the specifics of their game, how much does your goalkeeper get? They may go training twice a week but are they working on their goalkeeping or are they standing in goals watching the other players working on their game. 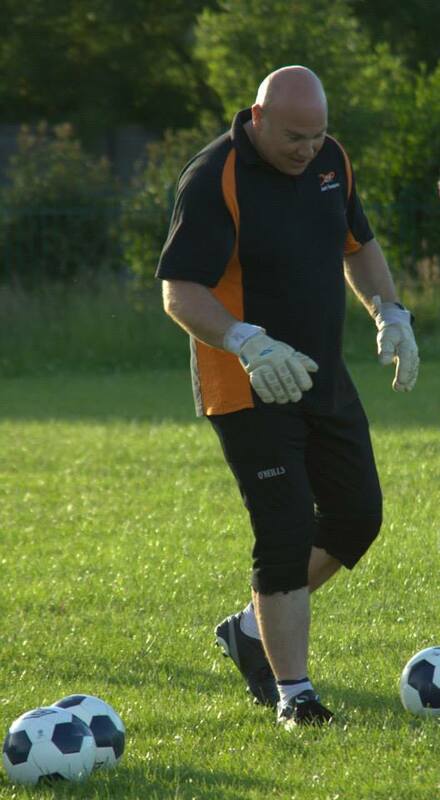 Not every club are fortunate enough to have the time or an experienced goalkeeping coach working weekly to develop their keepers. 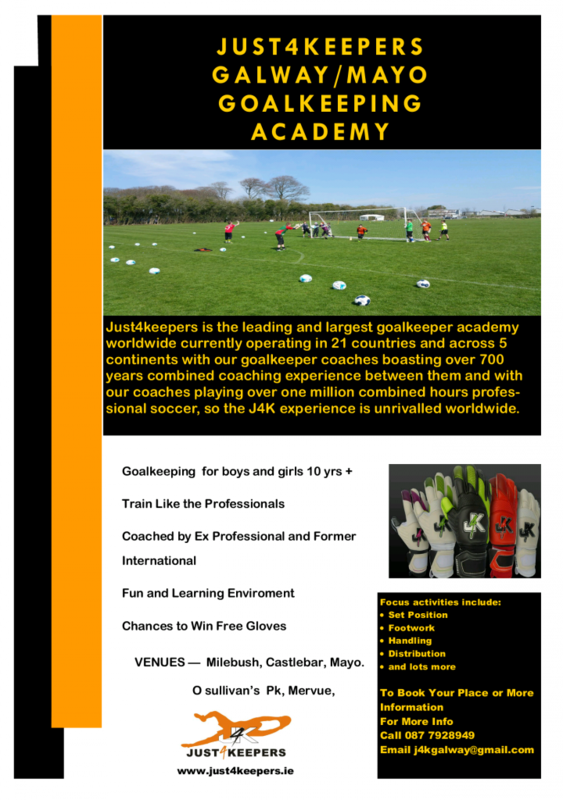 That’s where Just4Keepers Galway comes in, J4K provides goalkeeping coaching in Galway, an academy where goalkeepers from all over can come and be apart of the “goalkeeping Union”. An academy where goalkeepers can learn, work and develop their goalkeeping specific skills in a fun and professional environment with like minded keepers. 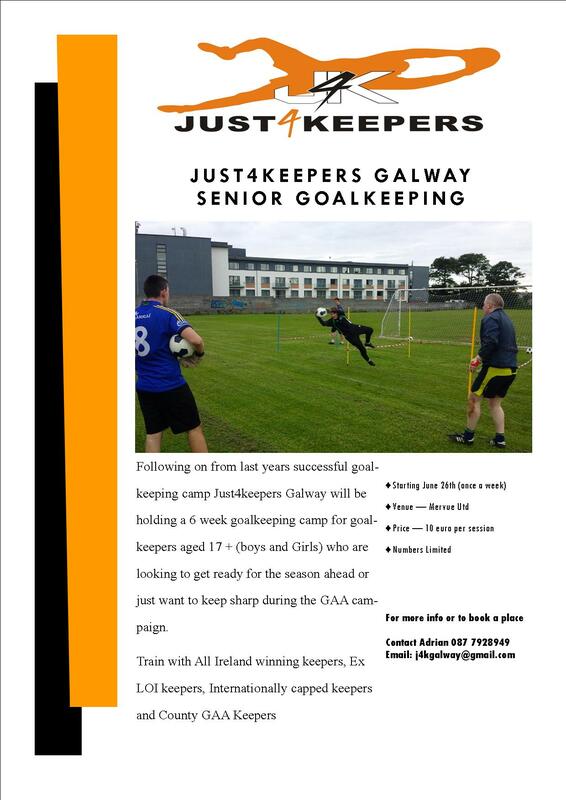 Why not come down and give it a go, your FIRST SESSION IS FREE, just email j4kgalway@gmail.com or call 087 7928949 to book your place. 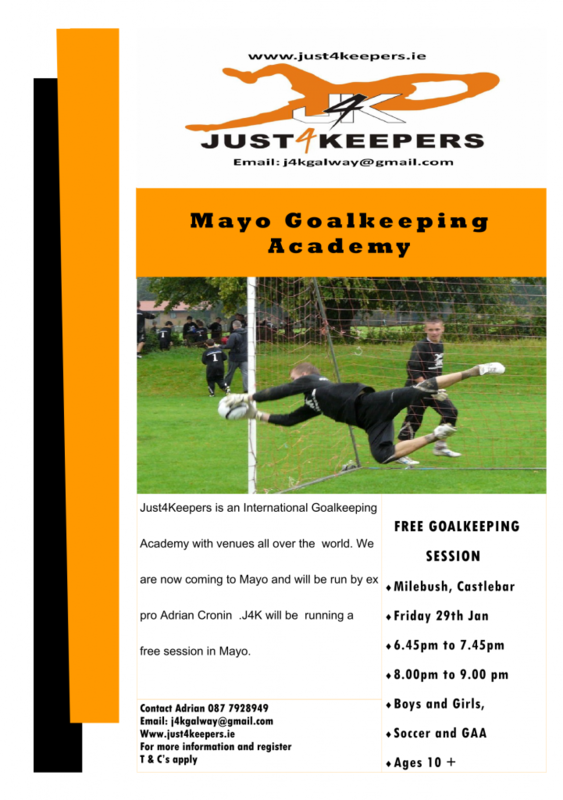 Places filling up for our J4K Goalkeeping academy in Galway next Wednesday. and 13 year to 17 year old group. First session is FREE. 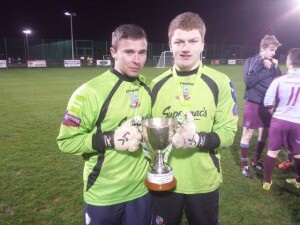 Congrats to Peter Healy and James Healy on becoming League of Ireland U19 Southern Division Champions..
Adrian started in goals at 9yrs old when in his very first training session with local side Newcastle Utd. He was put in goal for a penalty and saved it. While at Newcastle he represented Ireland at U.15 and U.16 level before attracting the attention of a number clubs from across from England and Scotland. Adrian had trials for Arsenal, Nottingham Forest and Dundee before signing for Millwall where he went on to play for Ireland U.18 in the European Championships, play in the FA Cup for Chesham on Loan and play in the FA Youth Cup Final against Arsenal. After being released by Millwall, Adrian came home and had numerous offers to play in the Irish League and League of Ireland and final settled with local League of Ireland side Galway Utd.18 months after signing for Galway Utd Adrian had to retire from full time football through injury. 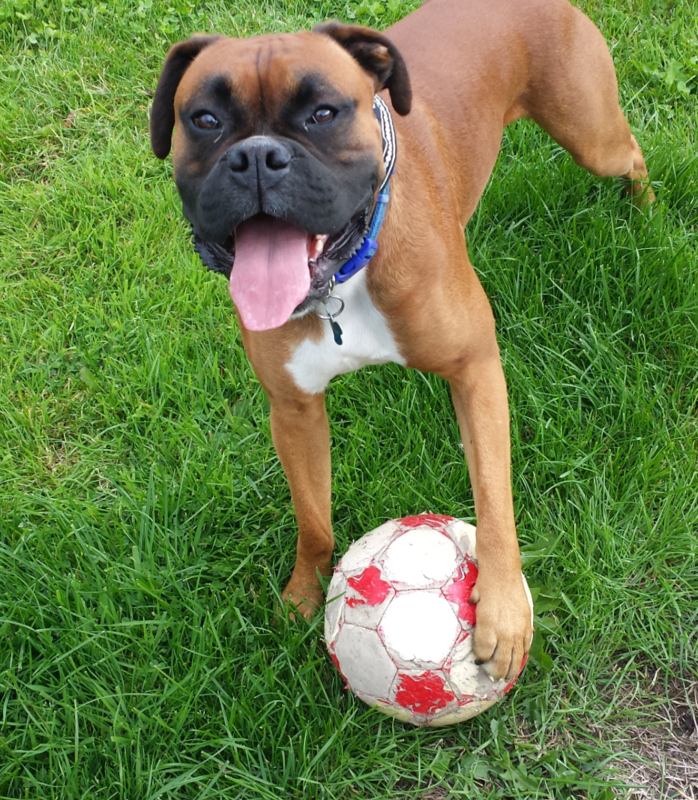 Adrian went on to play for numerous local teams winning many titles, being voted football sports star of the year and playing in the FAI Junior cup final with Athenry FC. 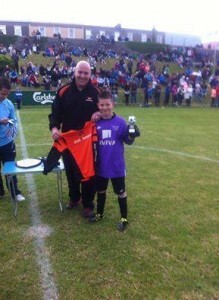 During this time Adrian went into coaching goalkeepers , and has been goalkeeping coach for the Ireland U.15 Umbro cup team, Galway Utd and Mervue Utd League of Ireland teams, senior goalkeeping coaching coach for both the Galway and Connaught Emerging Talent Programme, and is the currently the Goalkeeping Development Coach for the Galway FA. He has helped develop keepers who have gone on to receive international caps, play in the League of Ireland and sign professional contracts.